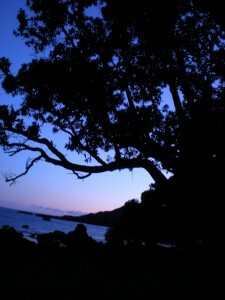 New Zealand - it's pretty easy to pick out the eastern-most point! Who knew sea urchins would be flying through the air on my behalf when we headed for the eastern wilds? 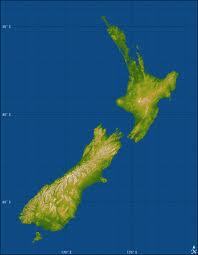 The North Island of New Zealand is shaped a bit like a four-armed starfish. The northeastern arm – the “East Cape” – is known as one of the most isolated and unchanged places in New Zealand. According to tourism brochures, 98% of the population is Maori, most traditional Maori practices are still followed, and every small settlement has its own ornate and beautifully carved marae (traditional Maori communal/sacred building which serves religious and social purposes). Regular, surprising experiences of unabashed racism against Maori by non-Maori New Zealanders left me wondering whether or not the eastern locals would be prone to assuming anyone white was likely to be a racist so-and-so. Thankfully, that didn’t seem the case! 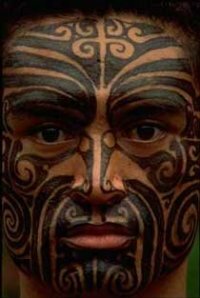 An example of Maori facial tattooing. They're about as common as dreadlocks in Humboldt County. Not everyone has them, but you're not surprised when you see them. It's more common for people just to tattoo between their lower lip and chin versus the whole face. What the inside of a sea urchin looks like! You eat the orange bit. It's not as slimy as a raw oyster. It's very salty and sort of dissolves like cotton candy in your mouth! completely covered. It was cool! The diver resurfaced with lots of mussels in his bag, and they promptly sent several sailing over our heads onto the wharf for us to gather up. We bid the fishermen grinning goodluck and goodbyes and headed back to cook up our impromptu feast*! Soon we’d made our way up the coast to another historic wharf. This one still had the actual rail car. In the background were crumbling facades of the wharf’s former self. Pat pointed out that what looked like solid concrete walls were actually bricks with plaster over the top. Was this a standard building style? We explored, exchanged smiles with locals wandering by, and even avoided being crushed by falling bricks! me from the moment I heard of it. I pulled over and ran back to see what he could tell me. I only got in about two questions before he told me, “If you really want to know, you ought to just go up the street there and see.” It took a bit of clarifying before I realized he was inviting me to the village marae – the traditional Maori gathering house that all the tourist pamphlets warn you not to ever enter or even photograph without permission. I happily followed his instructions up the hill and through a gate in a white picket fence, spying the intricately carved archway across the yard. I heard voices inside and timidly knocked at the door. No answer, so I wandered in, cleared my throat, and explained my presence to the first person who made eye contact. “Karen” was the ringleader. She shook my hand and gave my my first hongi – a traditional Maori greeting done by done by pressing one’s nose and forehead (at the same time) to another person. She answered my first flax fiber questions with “Here. Sit down. Have some tea first!” So, tea, sandwiches, cookies (biscuits) and a feast of (more!) mussels later, I was finally standing in front of the beginnings of a big tapestry rug they were weaving for a marae opening in their ancestral Rarotonga (in the South Pacific). 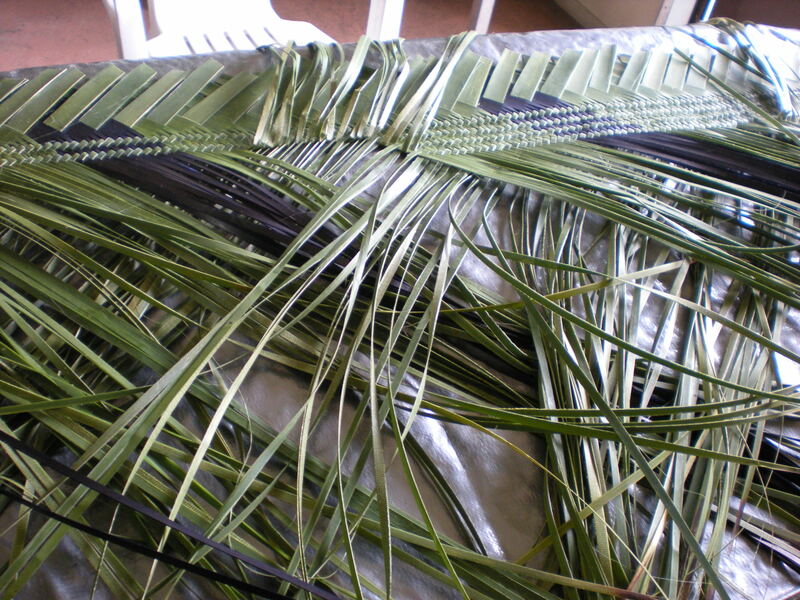 I learned a bit about how the flax is prepared, then cut into symmetrical strips, then sliced into four weaving fingers each, then woven. I also learned how a few strips of flax are dyed and then incorporated into the weaving for beautiful design effects. Karen’s pre-schooler, Niki, was adorable, and a highlight of the whole experience. She proudly displayed her fashion genius – one pink and one purple flip flop, showed me the clicking noise she could make with her mouth, shyly told me how pretty my earrings were (the worn silver hoops that I haven’t bothered to take out for two years running), and nodded vigorously when I explained that I had to go and did she want a hug? So cute! The next stop was supposed to be a visitor’s center. It was closed, but “Kai Kart” (literally “food” kart) across the street wasn’t. 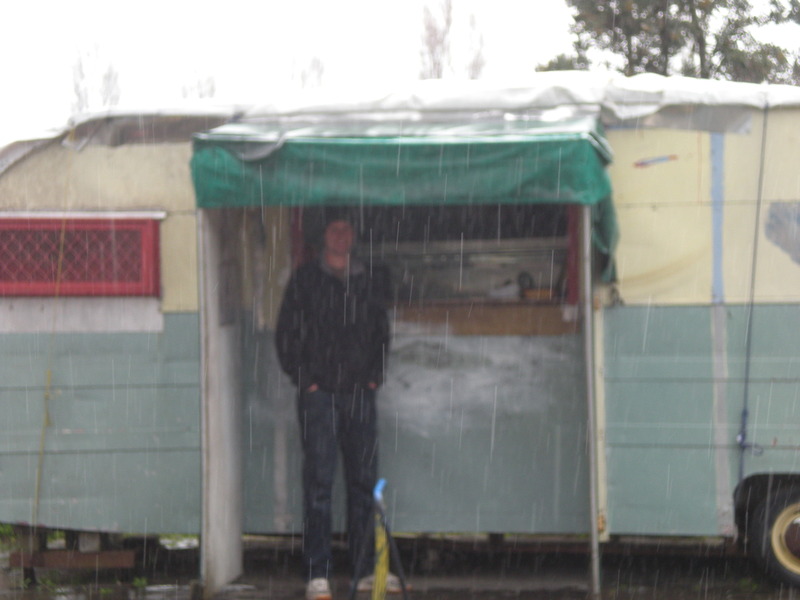 This place had been mentioned in every brochure, so despite it’s shoddy appearance we placed an order! The kumara fries were delicious! (Kumara is sort of like a potato, and it’s been grown in New Zealand for at least 500 years). We finished our snack and headed for the most iconic stop on the trip – the point farthest east in New Zealand. It’s 20 km down a rough road to a parking lot in a farmer’s field. Don’t worry, the horses will keep an eye on your car as you climb the 700 steps (at a step per second, it takes 11 minutes!) 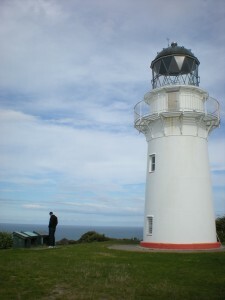 up to the East Cape Lighthouse and gaze out into the vast Pacific from as far east as you can stand on the mainland! On the drive back, I couldn’t resist exploring the tide pools – a favorite activity of mine. I’ve found most shoreline New Zealand tide pools to be devoid of all the awesome creatures and plants found on the U.S. Pacific coast. Here, I’ve not found any sea anemones, no sea urchins, no starfish, no sea cucumbers, and almost no plant life (comparatively). What few lichen-like plants there are all have a pinkish-mauve hue. This time around, I finally found some life! MY best find, I can’t actually identify. It looked like a giant snail, was about the size of a tennis ball, and its foot was neon orange! I also saw waring hermit crabs, a few palm-sized regular crabs, and the usual chiton and snails. 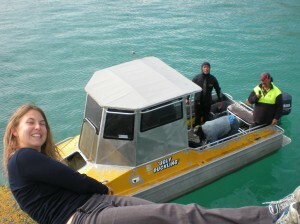 Out on the rocks, I met some snail foragers and asked them where are the urchins, anemones, etc. Were. 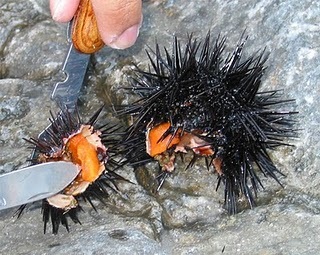 Later a fisherman would second their hypothesis that all the urchins and what-not have been foraged out! Pat’s yoga and photos of other coastal delights by clicking here. * Opportunistic cooking is one thing I really enjoy about our nomadic existence here. A bit like ancient nomads, we have everything we own with us everywhere we go. Obviously we’re not as minimalist as the ancients, but we’re still more in tune with the rhythms of life (as compared to my former existences). Instead of eating when the clock says it’s time, we eat when we’re hungry or when the food demands we do (fresh mussels, an accidentally dropped carton of eggs, etc.) It’s easy to remember my office days, checking the clock to see if my monotony-inspired hunger had any legitimacy to it.